This card was inspired by challenges APRVSN17M and Tuesday Morning Sketch #396. The Virtual Stamp Night challenge was to make a card with no stamping on it, so I used papers from the Spring Things pad and I punched a sun image with the sentiment You are my Sunshine around it out of one of the patterned papers. The little stars were keftover die-cuts from the Star Blast Edgelits I used on another project. I painted the sunshine with the Clear Wink of Stella brush to give it a bit of shimmer, and I used the Stitched Shapes Framelits for the square behind the sun. I found out that the Sweet Stitches Designer brads I've had in my stash for a while were a good match for the colours of those papers, so I lined three up at the top of the card. 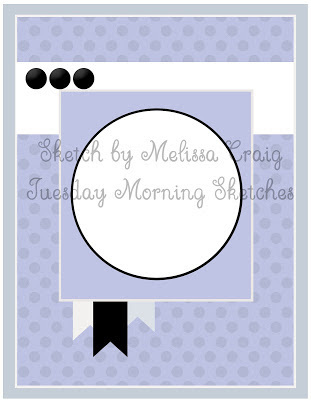 I also added a white rub-on from an old Easter Egg kit Stampin' Up! used to sell. Gorgeous card! I love love love those buttons! Thank you for joining us at Tuesday Morning Sketches. Great card. Well done on the no stamping challenge. Your colors are great and I love your take on our sketch. Thanks for joining us at Tuesday Morning Sketches. Sweet card! What a great mix of papers, and I love those brads!! This is such a fresh & pretty card Cindy, I love it! Thanks so much for creating with us this week at Tuesday Morning Sketches!